Looking to improve rounded shoulders? Here are 4 exercises you should be doing right now. I’ve noticed recently that my increased time of sitting at a desk is wreaking havoc on my upper body, especially my neck and shoulders. My shoulders have become a bit more rounded and my posture is starting to suffer. Anyone else in the same boat?? Rounded shoulders happen with the chest muscle becomes tight, thus creating more of a pull on the shoulders. In turn, the back muscles (such as the rhomboids) stretch and lengthen, making them weaker. Grab a set of light dumbbells and place feet hip-width apart, knees bent. Bend forward at the hips and let arms hang straight down from your shoulders, palms facing in. Roll shoulders back and down, away from ears. Raise both arms out to sides as you squeeze shoulder blades together. Return to start. Do 3 sets of 15 reps. Sit on the floor, legs extended in front of you. Wrap a resistance band around feet and grasp each end, palms facing each other. Bend arms and draw hands towards sides, elbows pointing behind you. Return to start. Do 3 sets of 12 reps. There are many ways to perform a chest stretch – you can sit, stand, or even use a stability ball. When sitting or standing, interlock hands behind your back with palms facing inward. Lean slightly forward and lift arms behind you. Hold for about 30 seconds. Lie on stomach with palms of hands flat on ground directly beneath shoulders. Legs should be straight with tops of feet on ground. Pull abdominal muscles up toward your spine and press up, lifting chest off ground, completely straightening arms. Lift chin up to the ceiling without hunching shoulders up towards ears. To avoid this, keep neck elongated by gliding your shoulder blades down your back toward your hip bones. Hold position for about 30 seconds. Ugh my posture is terrible! I have a really long torso that I think also contributes to my lack of sitting/standing up straight. I need to start paying more attention to how I sit at my desk and just how I carry myself in general. I'm the same way! I read about one woman who hung a mirror on the wall by her chair so she can actually *see* when she's slouching. Maybe that would help? Ahhh - this post just reminded me to sit up! :) My posture is generally good... except for when I'm at my desk at work, which is kind of a lot. Whoops! Love seated rows! My posture is just awful! I have very broad shoulders & have always had upper back pain b/c of it. I'm definitely going to try these moves! Woo-hoo, thanks for sharing! My posture is so terrible, I've been trying to work on strengthening my back to improve it though! I've also found that Pilates and yoga really helps to improve my posture. My posture while sitting at my desk all day is terrible! I need to do all of these exercises to avoid the pain in my neck and shoulders by the end of the day. I'm glad you mentioned some strength training exercises. Since I started weight training more regularly, I have noticed tremendous improvements in my posture! Good tips! I'm sure we could all use a reminder to try to sit up straight...I know I sat up straight after reading this haha! Oh my gosh!! I totally sat up straight after looking at this picture! Lol! I am so bad about setting like a couple of those. Being at a computer all day is really horrible on the back. I try really hard to stretch throughout the day, but don't always get the chance. My new year's resolution was to improve my posture!!! This is a great post--I like the exercise ideas. While my posture isn't terrible, I can tell that it has been deteriorating the more I spend time in front of a computer. I'm trying to correct things before they become bad. It's definitely a work in progress though! SO crazy that you chose today to do a post on posture. Earlier this morning I noticed myself in the mirror and could not believe how rounded my shoulders have become. Thank you, desk job. I'll definitely be incorporating these moves into my workout tonight. Thanks!! Just what I needed to read because my posture is not very good right now. I sit at a desk for upwards of 10 hours a day, and even though I get up and move around every so often, it's not enough. I'm going to incorporate some of those stretches into my daily routine! Thanks for sharing! Work your front and your back of your upper bod to maintain balance! You should be able to push and pull similar amount of weight. i can't imagine my posture is all that great. especially sitting at a desk for 8 hours. and being over 6 feet tall, i find myself bending over to use certain things that would be at a normal height for shorter people or having to duck to not hit my head on things.... thanks for the exercises and stretches! i can definitely use em! Thank you for these exercises! I totally need them! My shoulders round forward all the time and I try my best to be conscious of fixing it! I find mobility and stretching them well really helps! Thanks for the tips. My shoulders have been bad lately - to the point where my right shoulder actually HURTS. My posture is not the best and I've noticed this neck pain that comes on when I've been at my computer for very long. It all started when I started my blog......hmmmm....I wonder why?!?! Great info and thanks for the exercises, I'll give them a try. Happy baking! I try to always think about how my posture it. I have to actively make and effort to have proper posture. I just don't want to be old and hunched over, no way! I definitely need this! Whether I'm at a job where I'm sitting all day (luckily I've only had one of those for a few months) or standing all day, I notice my posture worsening throughout the day and go home with an aching back. I need to try some of these tips - thanks! My posture is horrible! Especially since I am either on my laptop at home, with no desk...always on the bed, and then at work behind a desk. So I am always stretching! I do love the Cobra Stretch! It is one of my favorite stretches. On a note I really want to try that Salad! I have never tried feta cheese but I really want to try it! That salad looks so delicious! The hubby and I are thinking about getting ball chairs for work since we both sit at a desk all day and feel like that would def help with posture! Interesting; I never really thought that certain exercises could help rounded shoulders! I actually stand for the majority of my day, but I could definitely improve my posture when I'm sitting! I actually have pretty decent posture. After years of being a swimmer and having my coach yell at me whenever I rounded my shoulders, I finally got the lessen and never looked back;) ha ha. I love all the colours in that salad, how pretty! This is great! Being in law school I'm always hunched over a computer or book, I need to work on my back strength! I was JUST talking about this the other day! I love my job but I really wish I wasn't stuck sitting at a desk all day because I too am noticing my posture is not very good! I'm definitely a sloucher - I'm seeing lots of reverse flies in my future! Great post! I notice so many students with rounded shoulders (and back). I think this generation is just sitting all the time, so unless they are actively trying to keeping good posture, it's bound to happen. I definitely do the downward dog and reverse fly to keep my posture. Ugh, I'm so bad about my posture. I'm glad you posted this. I really need to do some of those exercises. Thanks for the reminder! Sometimes my slouch at my desk looks exactly like the cartoon guys in the picture! I also catch myself rounding out my shoulders when I'm driving. This post couldn't have come at a better time! I actually just got home from a doctor's appointment for a few things, one of them being back pain! While I'm not allowed to use any weights or do any mat work for a while, the last two may help! Thanks for the info! BTW that salad looks DELISH! I like these stretches! My shoulders are rounded too, and I think it's from years of sitting in school at my desk all slouched over. I need to start working on standing and sitting straighter! HAha as I was reading this I felt like I was getting a smack on the wrist and straightened up immediately. Posture is something many of us forget about too easily, even when we walk around. I am going to make a habit of improving my posture as I'm walking about- it's amazing the difference it makes. I have a desk job currently, and I am ALWAYS so worried about the rounded shoulders! When sitting at my desk I consciously sit up tall and roll my shoulders back several times a day to adjust...!!! My posture is only so-so, but I inherited pretty broad shoulders from my mom. I've never really given it much thought but I'm feeling grateful about it now! Thanks for the exercises! 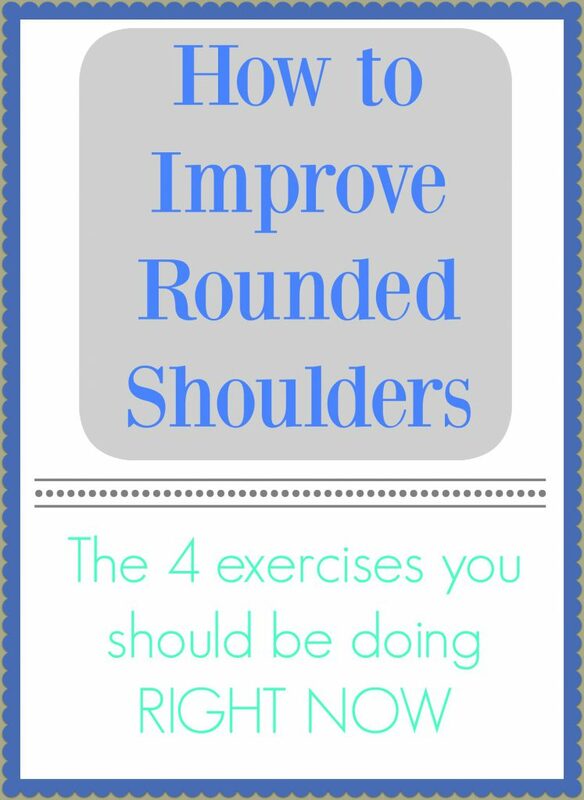 Yes, I have rounded shoulders for sure!